Photograph courtesy Ron Kosys. On May 1st 1986 the 6T68 13.40 SX Warrington Arpley - Ellesmere Port freight passes through Helsby behind 25911. The nineteen year nine month career of D7666/25316 was spent allocated to only London Midland Region depots. Center lampbracket & other fittings removed (No.1 cab only). Time between last Classified repair and withdrawal: 108 months. July 1971 to London Division (D01). January 31st 1984 - retired. April 12th 1984 - reinstated to Longsight. August 11th 1986 to store. Renumbered into TOPS March 16th 1974. 25911 was the 295th Class 25 withdrawn, one of seven withdrawn during September 1986 including shedmates 25905, 25907 & 25909. After withdrawal 25911 was stored at Kingmoor. It was taken to Upperby depot on July 14th 1988, then returned to Kingmoor. It again visited Upperby depot on November 10th 1988 and was then dispatched to Crewe Basford Hall on November 30th 1988, reaching Leicester stabling point (via Toton) on December 15th 1988. Five days later it reached Vic Berry's Yard. During the first week of March 1989 cutting up commenced, by March 23rd 1989 25316/25911 was no more. Photograph courtesy Gary Thornton. Having been removed from the stack and un-ceremoniously chopped in two 25911 awaits its final deliverance, March 5th 1989. Noted Derby Works July & August 1977 (Classified & full repaint). Noted Derby Works October 1977. Noted Derby Works December 1979 - February 1980 (power unit repairs). Noted Derby Works August 1981 - October 1981 (collision damage). Laid down in the summer of 1966 at Derby Works as part of order No. 11001, D7666 was part of the order transferred from Beyer Peacock. D7666 was delivered from Derby during December to the London Division (D01). D7666 was delivered in blue livery with full yellow ends. Twelve new Type 2s (D7660 - D7671) were allocated to Willesden to take over the empty coaching stock, parcels and local freight duties in the London area. With the arrival of these locomotives it was possible to release the remaining Class 24s to the Stoke Division, as part of the eradication of steam in the North West. Of this batch of Class 25s D7660 - D7669 were dual braked from new, whilst D7670 & D7671 were not, however these latter two were quickly transferred to the Nottingham Division (D16). On December 30th D7666 was noted at Clapham Junction on an inter-regional freight (7O80). Condition December: blue/yellow livery, emblems on each cabside, two numbers on each bodyside, no blanking plates, hand/footholds present, three-rung bogie mounted footsteps, straight sided sandboxes. Condition no month: blue/yellow livery, emblems on each cabside, two numbers on each bodyside, blanking plates fitted (? ), hand/footholds present, three-rung bogie mounted footsteps, straight sided sandboxes, three piece miniature snowploughs fitted, buffer steam pipe connections present. Another Class 25 to reach Paddington on a passenger working was 7666 on January 21st bringing in the 07.35 Oxford - Paddington after the booked locomotive, Class 47 No.1925 had failed. 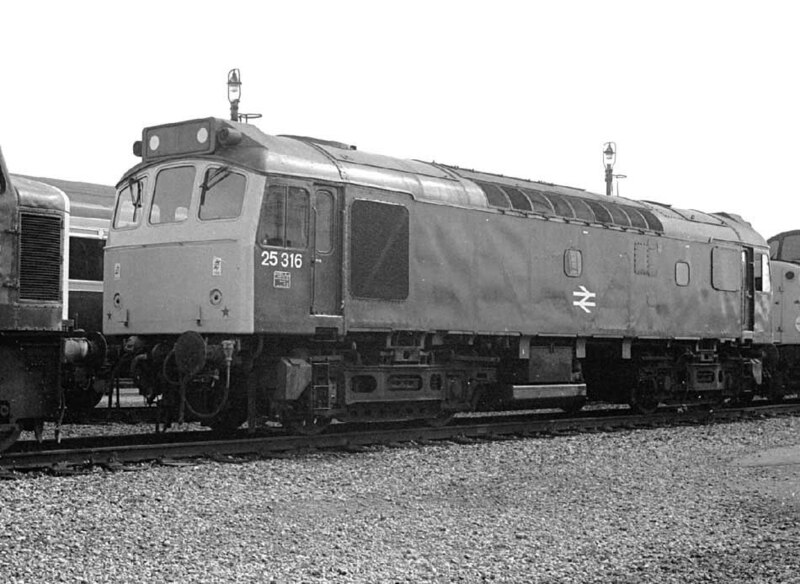 The Class 25 was manned by a Bletchley crew with a Western Region pilot, seven minutes were lost on the journey, final arrival was thirty five minutes late. On August 29th 25316 & 25286 were noted passing Castleford with the 6L42 Tilcon company train. A stranger on the 10.22 Worcester - Birmingham New Street service on September 16th was 25316. Derby Works was visited by 25316 in June & July with collision damage, and later noted back at Derby in October. This was the last classified repair for 25316. With intervals between shopping spanning several years at a minimum the condition of locomotives arriving for repair often revealed faded & flaking paint, dings and dents and considerable rust patches, if not major holes in the panelling. Seen here in such condition is 25316 on June 18th 1977. It was another trip to the East Coast for 25316 & 25069 on August 6th working the 08.00 Walsall - Yarmouth as far as Norwich and returning with the diagrammed 14.15 to Walsall. 25316 was back in Derby Works from December 1979 to February 1980 with N1 repairs. During November 25316 received an 'E' examination at Cricklewood. In the early morning hours of February 8th 25316 assisted a southbound WCML service between Bletchley and Stonebridge Park due to the power being off for engineering work. This same locomotive handled a similar duty on March 29th, this time between Rugby & Bletchley. Engineering work at Rugby on May 10th found 25316 assisting trains over a very short dead section in the vicinity of Rugby station. 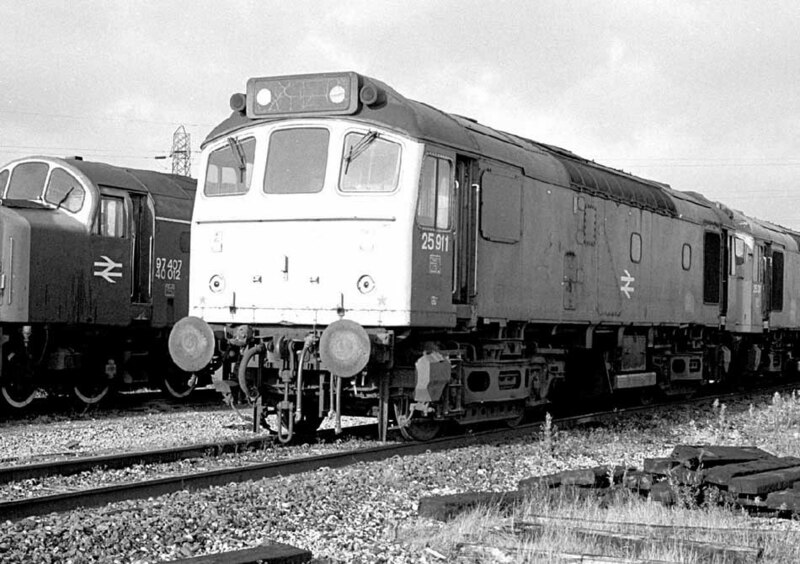 On May 12th 85022, running light at Speke Jct, collided with 25316 & 25313 working the 00.19 Garston – Forders brickliner. 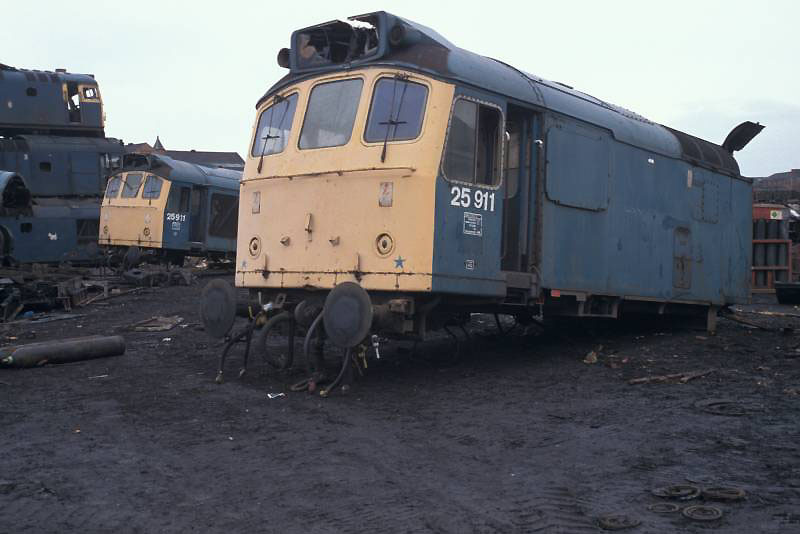 25316 sustained damage to the No.1 cab and was moved to Derby Works two days later. 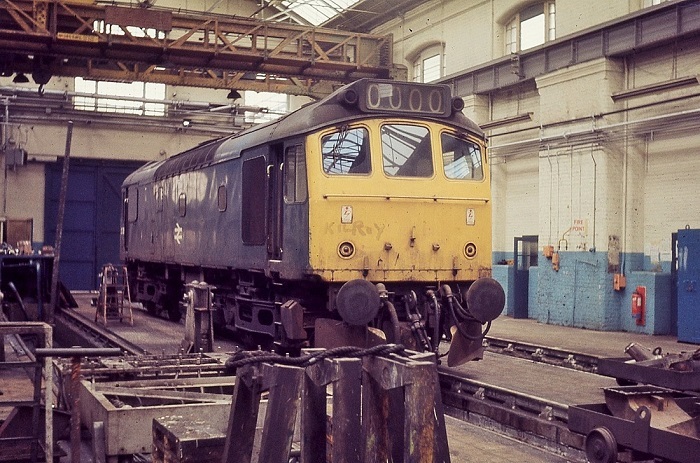 It would spend from August to October under repair at Derby, surprisingly repairs were granted at a time when such damage would have condemned most Class 25s to the scrapheap. Photograph courtesy Adrian Healey. 25316 at Derby Works May 27th 1981, having just arrived with considerable cab damage. This machine would receive a new cab and live to fight another day, eventually becoming 25911. Photograph courtesy Steve Morris. 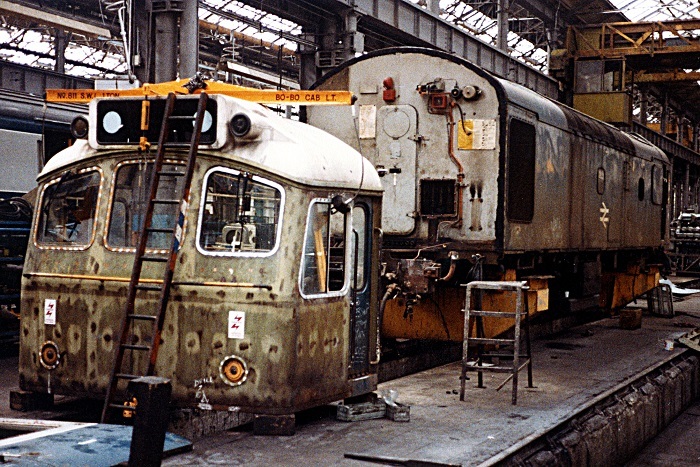 Its August 1981 and 25316 is in the erecting shop about to have a replacement cab fitted. On March 5th 25316 was noted at Long Preston with loaded ballast wagons. 25316 worked the 6E54 Ribblehead - Healey Mills ballast on April 28th. On May 27th 25316 worked loaded ICI limestone PHV hoppers from Tunstead to Northwich. 25316 was stabled at Severn Tunnel Junction on July 26th. On August 20th 25316 worked the 08.35 Glasgow Central - Stranraer Harbour throughout. On September 11th 25316 was on display at Carlisle Upperby Open Day. 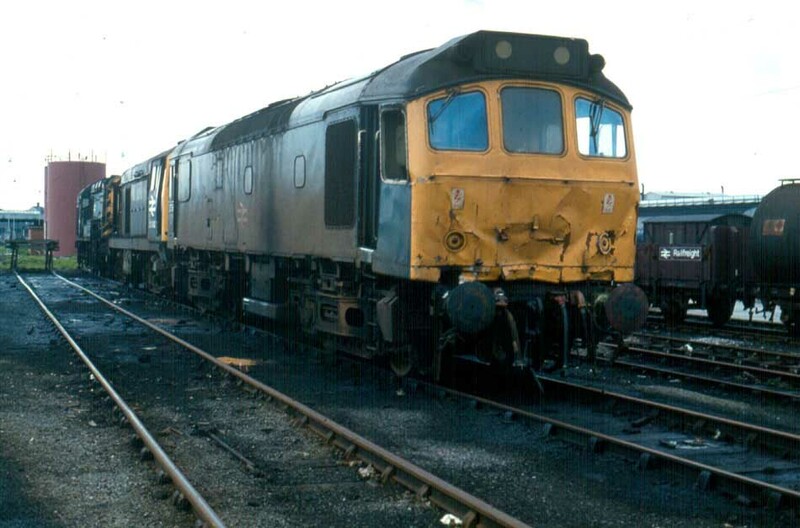 Photograph courtesy Tony Sayer 25316 at Carlisle Upperby Open Day, September 12th 1982. 25316 was noted on March 6th's 02.35 Euston - Bletchley. 25316 & 25233 were noted at Stratford depot on April 16th. On the evening of May 26th 25316 was noted with a late running Mountsorrel - Radlett working. 25316 was stabled at Bescot on June 3rd. 25316 & 25289 were in use on the Cambrian lines on June 4th, working the 07.44 Shrewsbury - Aberystwyth and coming back east with 10.10 Aberystwyth - Euston as far as Wolverhampton. July 3rd's (?) 10.10 Euston - Shrewsbury featured 25305 & 25316 forward from Birmingham New Street. On August 4th 25316 was noted westbound at Stamford with a mixed freight. 25079, 25316 and a 3rd Class 25 were stabled at Rugby station on August 6th. 25316 & 25239 assisted an electric service between Rugby & Bletchley on August 7th due to the power being off for engineering work. 25316 was noted southbound at Warrington Bank Quay with a freight on September 29th. After almost eleven years at Cricklewood 25316 was transferred to Longsight during January. On January 14th 25316 was stabled at Birkenhead . On January 27th 25316 failed whilst working the Heysham - Tees ammonia train at Keighley. The locomotive was withdrawn on January 31st and initially dumped at York before being moved to Doncaster depot. From here it was moved to Toton on March 21st and was re-instated back to Longsight on April 12th. 25316 was noted southbound through York with empty coaching stock from Clifton Carriage Sidings on April 19th. Having worked the empty coaching stock from Cricklewood to Marylebone, the 'Anglo-Scottish Freighter' railtour started out from Marylebone behind 25316 & 25321 on May 4th, this pair working as far as Toton. 25316 worked the 6V93 Mossend - Severn Tunnel Junction Speedlink service forward from Crewe on July 20th. Three days later on July 23rd 25316 worked the 9C07 12.30 Hereford - Severn Tunnel Junction freight. On August 12th 25316 was working with an electrification train at Farington Curve Junction. A working once familiar to the Class 25s was seeing a greater use of other classes, the 18.12 Manchester – St Pancras parcels, on August 20th 25316 worked this service to Derby. A diesel multiple unit failure on August 25th found 25316 working the 11.25 Southport - York service throughout. A Carlisle - Euston steam charter on September 15th utilised 25316 as far as Leeds, replaced here by a Class 31/4. And later in the month (29th) 25316 took over a Scarborough - Bangor service at Chester, returning with the diagram - the 17.32 Bangor - York as far as Manchester Victoria. On 24th October an additional lengthy westbound freightliner (4Z92) was noted departing March Down Yard behind 25316. Pre-Christmas travellers on December 20th found 25316 working the 17.27 Leicester - Birmingham New Street, with a failed Class 31 and the stock of a late running Norwich train. On February 16th 25316 was stabled at Birkenhead. On February 23rd 25316 was in rescue mode at Kilmarnock assisting a Class 47 forward to Glasgow on an ex-Carlisle service. A charter from Stranraer Harbour to Dover on March 7th was worked by 25315 & 27206 to Ayr where 20048 & 20137 took over. On March 21st 25316 took out a morning freight to Margam, leaving with the next evening’s (22nd’s) empties to Great Rocks. 25316 was stabled at Bescot on April 8th. 25316 worked the 6L10 ballast trip from Birkenhead North to Ince Moss tip on April 22nd. During May 25316 was transferred to Crewe. On May 1st 25313 & 25316 were noted southbound passings Springs Branch with an oil train (for Stanlow?). May 3rd saw 25316 & 25313 working the Carstairs - Edinburgh portion of a relief service from Bristol. The next day (4th) 47503 failed at Hellifield with the 05.13 Euston – Stranraer Harbour parcels, 25316 assisted through to Carlisle. Later that day a diesel multiple unit failure on the 17.42 Carlisle - Newcastle was covered by 25316 throughout. Frontline duty befell 25316 & 25257 on July 16th when they worked the 10.45 Euston - Ayr forward from Carlisle. The following week 25316 was back in action on Scottish passenger duties covering a round-trip Carlisle - Glasgow service on July 23rd. 25316 was stabled at March on August 10th. 25316 was noted passing Ffynnongroew with a short freight train headed for Warrington Arpley on September 23rd. During November 25316 was busy over the North-West area, on 8th covering the 08.47 Holyhead - Newcastle between Manchester Victoria and Leeds Heckmondwick, on the 11th assisted a failed diesel multiple unit between St Helens Shaw Street & Wigan NW and finally on 16th, with 25199 taking the 18.05 Euston - Barrow forward from Preston. 25316 was transferred to Kingmoor in November and renumbered 25911 in December. 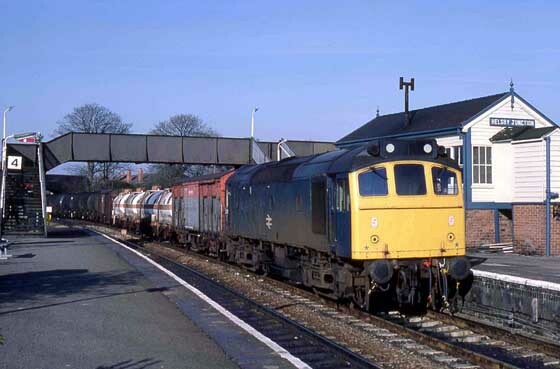 On March 15th 25911 & 25913 worked the Stanlow - Leeds oil tanks. 25911 & 25909 were noted eastbound at Chester with a mixed freight on April 6th. 25316 was noted at Hereford with an engineers train on April 17th. On May 1st the 6T68 13.40 SX Warrington Arpley - Ellesmere Port freight was worked by 25911. When 304013 working a morning Liverpool – Crewe service on May 30th failed at Ditton, the nearest help was 25901 & 25911, assisting to Runcorn where the passenger service was terminated. On June 7th 25259 & 25911 were noted eastbound at Manchester Victoria with a train of track panels. 25911 was placed in store on August 11th 1986 and finally withdrawn on September 13th 1986. It was initially stored at Kingmoor. Photograph courtesy Tony Sayer. 25911 at Kingmoor on October 30th 1986, about six weeks after withdrawal. No.2 cab driver's side: unpainted side window frame: April 1986. Three piece miniature snowploughs fitted: February 1985, April 1985, May 1985, April 1986. Page added August 5th 2006.